Oh boy, knowing where to start with this awesome wedding adventure is quite the tough one. Why? Well, Gemma & Andy had been in the planning stage for well, almost two years. And after putting the original plans on hold, they waited it out to make sure they planned an intimate day with not a single detail forgotten. And yes, it’s definitely safe to say, these guys certainly know how to plan a wedding celebration, and one that is totally and utterly perfect for just the two of them; Their super close family and friends, their passions (unbelievably delicious food with the occasional dash of fast cars), and a cracking sense of style, all wrapped up in a setting they’d both always dreamed of getting married. The location, The Kennels at Goodwood in West Sussex, and woah, what a total pleasure it was to photograph!! With the venues historic past as the original Kennels to the estate (yep, including dog bowls from every century), they have transformed it into a pretty unique and intimate space. The ceremony in a room surrounded by the worlds largest collection of old classic Penguin books (cool huh!? 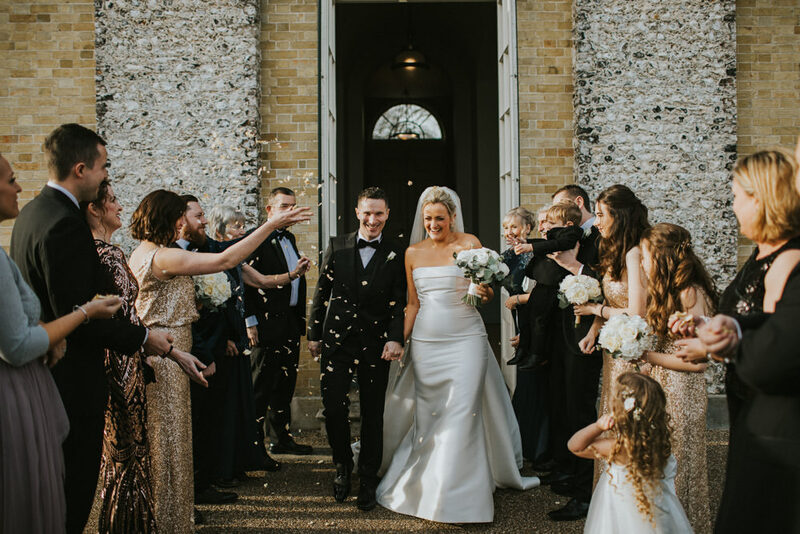 ), and a reception laced with amazing detail after amazing detail, it really helped Gemma & Andy totally encapsulate their loves, and their story into a perfect celebration that oozed an awesome style and warmth. Literally, the kinda warmth that made you sprint to get inside away from Januarys winter chill just to carry on being amongst it. There’s no other way of putting it, I really am going to miss having their wedding day to capture that’s for sure. Gemma & Andy, you’ve been an TOTAL blast to work with, and I’m so happy for you both that your wedding celebration was everything you’d both dreamt of. Congratulations! !